Editor's note: When a discontinued congregation vacates its campus because of declining membership, it may seem like a death knell. But some hear a clarion call to keep God's work in the house. This is the last in a series of stories about church campuses retooled to continue ministry in the afterlife of a departed congregation. ELOISE – By 2011, four years after Eloise UMC was discontinued, the church was housing a congregation of immigrants, so to speak -- but not from the surrounding community where farmworkers from Mexico and Central America were taking root. A community ministry center in Eloise near Winter Haven retains the look of a church as volunteers report there for God's work. Photos by Susan Green. 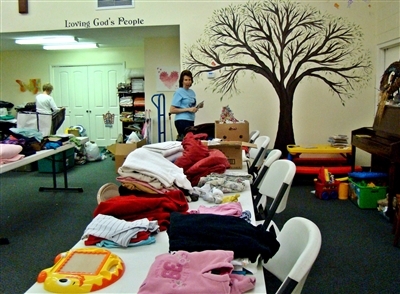 Volunteers have plenty of space to sort clothes, keep fabric and supplies for sewing classes and run a food pantry, among other ministries, at Project Love. 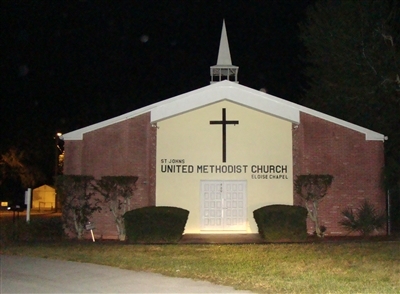 Nearby St. John’s UMC, Winter Haven, was charged with developing a mission on the Eloise campus, according to Florida Conference records. But a few former Eloise UMC members were driving from Bartow and Fort Meade to worship there, said Rev. Dan Parrish, who became St. John’s pastor in 2011. “There was a little remnant that the former pastor allowed to stay there and hold services on Sunday,” Parrish recalled. After Parrish was appointed to St. John’s, he met with the Eloise group to discuss their role in the future of the church campus. As St. John’s moved to provide Vacation Bible School, a health care clinic and other ministries to the local community, only one family from the former Eloise UMC initially took part. And that participation was short-lived. Today, the 50-year-old church building looks pretty much the same from the road. “Everything is the same from the outside,” said Janey Powell, who with her husband, Larry, and other volunteers from St. John’s and elsewhere, oversees a health care clinic called Angels Care in the Eloise church’s former fellowship hall. Inside the buildings, though, everything has changed. Butterfly artwork, courtesy of a local artist who teaches classes at the site, offers a symbol of transformation. The campus is now a community hub of services to address the spiritual and physical needs of the low-income residents who live nearby. 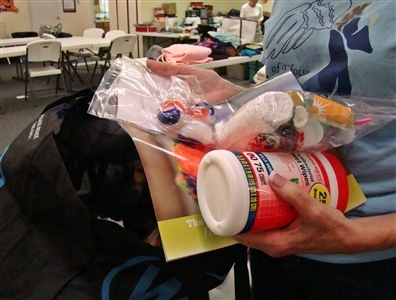 Detergent and toiletries for Project Love giveaway bags are among items that can help seniors save money for pressing needs. A plot of vegetables behind the former Eloise UMC offers community residents a chance to learn gardening skills through Project Love. The church sanctuary is now Project Love, named for a nationally recognized ministry started in the Eloise area long ago by St. John’s members under the leadership of Ann Thayer, who died in 2011. With the help of St. John’s members, community volunteers and United Methodist NOMADS workers, the church kitchen was remodeled and the former church sanctuary has been turned into a multipurpose space. Open three days a week, it accommodates sewing, art and nutrition classes, Bible study, a food pantry, a clothes closet and a place for volunteers to pack gift bags of toiletries and comfort items for seniors in need. 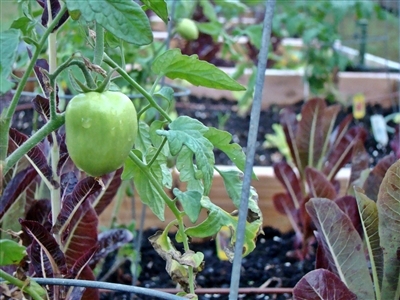 A small plot of vegetables staked out on campus provides an outdoor classroom for budding gardeners. Powell said she marvels at how quickly the ministries at Eloise came together. She rattles off donations that include medical equipment for Angels Care and industrial-sized coolers for Project Love. The resurrected Project Love opened in August 2013 and offered assistance to more than 650 people in its first six months of operation. About 6,000 have sought help at Angels Care since it opened in March 2011. About a dozen churches of various denominations have pulled together to supply funding and volunteers for the ministries. Parrish said he has been touched that some of those who receive services at the center return to volunteer.